In the month of March, 1888, one of the most severe blizzards in the recorded history of the United States raged along the east coast of the country, causing devastation from Chesapeake Bay to Maine. The storm claimed the lives of more than four hundred people. At least twenty-five percent of these casualties were seamen, lost to the unforgiving Atlantic Ocean. This is not surprising, taking into consideration that an estimated two hundred ships were either wrecked or grounded over a period of two days. Where there are shipwrecks, there are, invariably, spoils to be had. 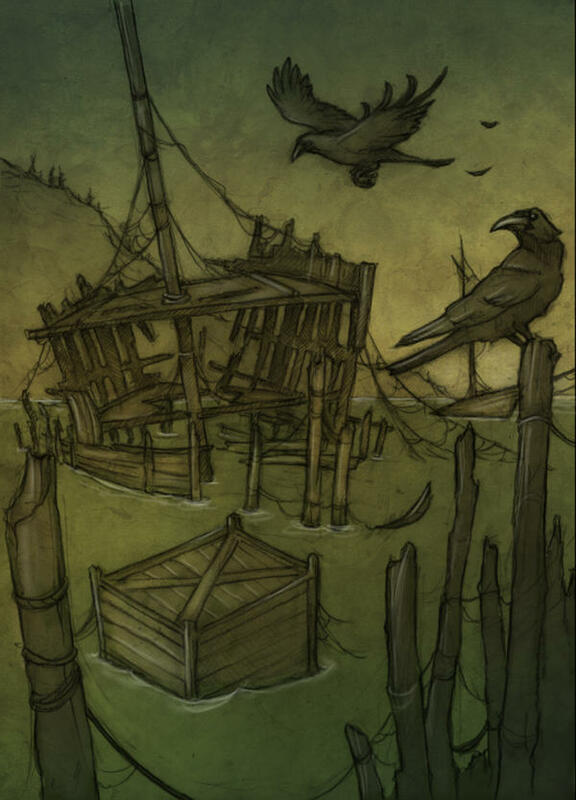 Regular readers of ‘The Vendetta’ will doubtless guess that some of these spoils found their way to the grateful shores of that somewhat strange and foggy island, Hopeless, Maine. Harriet Butterow and Petunia Middlestreet stood knee-deep in icy-cold water. They were anxious to drag a large wooden crate ashore. Neither woman had any clue as to what the crate may have contained but it did not really matter. What could not be eaten, or modified for personal use, could be bartered. On this impoverished island nothing was ever wasted. Try as they might, however, the crate was reluctant to move. The two young women had a lot in common; Harriet was a single mother and Petunia a widow. Besides having had a friendship which started in childhood, they also shared the bond of motherhood. Both had young daughters who, for today, were in the care of Petunia’s elderly father-in-law, the kindly Bartholomew Middlestreet, landlord of The Squid and Teapot. Harriet and Petunia were secure in the knowledge that their daughters, Amelia Butterow and Lilac Middlestreet, were in safe but albeit, somewhat arthritic, hands. Like many islanders, it was news of the several shipwrecks littering the coastline that had the pair braving the bitingly cold March morning and looking to salvage as much of the precious wreckage as possible. After the long winter, supplies of everything were low on Hopeless and while the loss of so many lives was deeply regrettable, the islanders could only marvel at their good fortune when they saw the extent of the bounty that the storm had provided. All that was needed now was to bring it safely ashore – a task easier said than done. It sometimes feels that Tragedy is a trickster always waiting in the wings and never missing an opportunity to show its face; sadly, that face is one that the people of Hopeless are more than familiar with. Even so, none are really ever prepared for it to appear. The sea had seemed unexpectedly calm that morning, especially after the raging nor’ easterlies that had angered it over the previous few days. Anyone who has lived or worked on the water will tell you that a change of wind direction can achieve that in just a few hours. And that same person would also caution you to be wary; wary of both a capricious sea and all that it contained. Amos Gannicox smiled to himself as he waved to Harriet. He had been on the island for almost four years now and had every intention of winning her heart completely before another year had passed. He was a patient man and felt sure that his patience would pay off before too long. He was well aware that Harriet still harboured hopes that Amelia’s father – who she genuinely believed to be a Selkie – would return to her, but almost seven years had passed since he had left and this seemed most unlikely. Lost in his own thoughts Amos was brought back to reality by a sudden scream. No – two screams. An icy hand gripped his heart. A few seconds ago two young women had stood in the water, laughing and care-free. Now they were gone. Look as he might, there was no sign of either. All that remained was the crate which they had been trying to shift. Amos scanned the shoreline frantically. This could not be – he had only taken his gaze off the object of his affections for a few seconds. Panic stricken he ran towards the spot where they had been standing. Others were running too, frantically shouting the women’s names but it was soon obvious that searching would be futile. They had disappeared completely. The ocean, or something dwelling within it, had claimed them. Bartholomew Middlestreet was devastated. Although the shadow of death always stalked the island, he never imagined that his daughter-in-law would be taken before he was and now it fell upon his old shoulders to tell two little girls that they had become orphans. Lilac, at three years old seemed too young to understand but Amelia Butterow, aged six, took it badly. So badly, in fact, that she was literally dumbstruck. The truth is that the girl never uttered another word for the remainder of her days. It is a strange coincidence for, as regular readers will recall, her father,who was of the seal-people, a Selkie, was never heard to speak either. Bartholomew was resolved to look after the girls himself; he had no intention of either of them going to the orphanage. The running of The Squid and Teapot would have to be left to Tobias Thrupp. Tobias, shipwrecked at the same time as Amos Gannicox, had been living there for four years and had done little enough, so far, to pay for his keep. Ten years slipped by; ten years that saw The Squid and Teapot decline in every way. Bartholmew Middlestreet devoted himself wholly to the well-being and education of the girls, oblivious to everything else, including the fact that Thrupp was dragging his beloved inn into certain ruin. Then, one day in the final year of the century, a strange thing happened. Bartholomew, Lilac and Amelia disappeared without a trace. And no one noticed! Whether Bartholomew died of natural causes, or by Thrupp’s hand, is unclear, but die he certainly did. One can only surmise as to the cause. What is known, however, is that a corpse left outside for a night on the headland is unlikely to still be there by daybreak. The age-old problem of disposing of the body is no problem at all on Hopeless. As the old man had been absent from the inn for so long, ownership of The Squid passed seamlessly to Thrupp. The girls, too, had not been seen for years and were all but forgotten. Such disappearances, while unfortunate, are not uncommon on this island. In unearthing and relating these tales for you it sometimes feels as though I am putting together a vast and complex jigsaw puzzle, filling intriguing gaps in the picture as each new piece comes to hand. Like any jigsaw, this one has areas filled with light and clarity; it also contains great sweeps of darkness. The rest of this tale is, I fear, one such piece, darker and more dreadful than any other I know, or, indeed, ever wish to know.